Art appreciation activity: polar bears afloat in the sea. 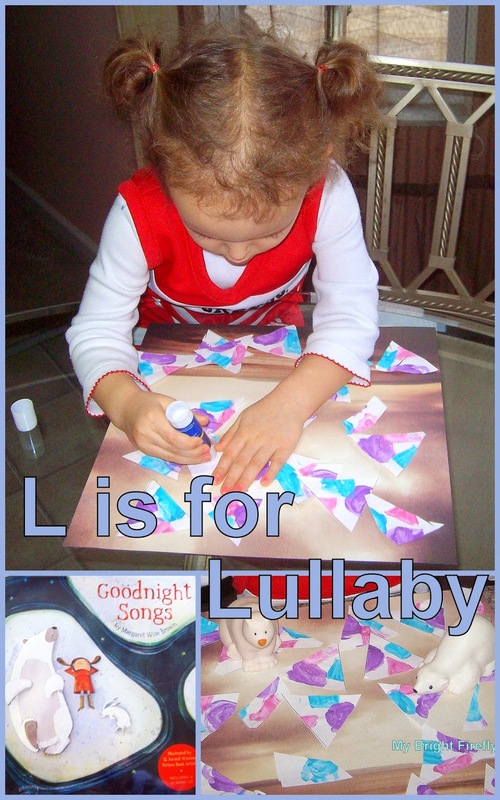 Our letter of the week, L is for Lullaby, inspired us to discuss lullaby songs and pretend play with lullabies. Goodnight Songs by Margaret Wise Brown was the treasure we discovered! This post is part of our "Creative ABCs" series. You can find our previous letter of the week activity here: G is for Globe. Land, Air, and Water. I am in awe with this book we discovered! It is a collection of lullabies that are published for the first time! The book comes with the 12-song CD. The beautiful lullabies are composed and performed beautifully. As if this is not enough, songs are illustrated by twelve award-winning picture book artists. "Sleep like a Rabbit" is illustrated by Isabel Roxas. We talked about the cold arctic ocean and the colors used for the picture (see the collage above). According to the illustrator, Isabel Roxas, it is "such a quiet, drowsy poem that when I was dreaming up ideas for the illustration, I tried to think of the quietest place one could sleep - which brought to mind snow and how it muffles street noises, and also the still-ness of ice." We talked about the shapes and textures of ice and icebergs and decided that triangles would be the best shapes to use for our arctic ocean. I was in search of perfect triangles for this activity, when I found the best and most fun ever here: Triangle Tessellation Puzzle. from Mama Miss. Pictured below, I printed out 2 triangles for My Firefly to color. I color coded the shapes inside: triangle-red, square-blue, circle-purple. 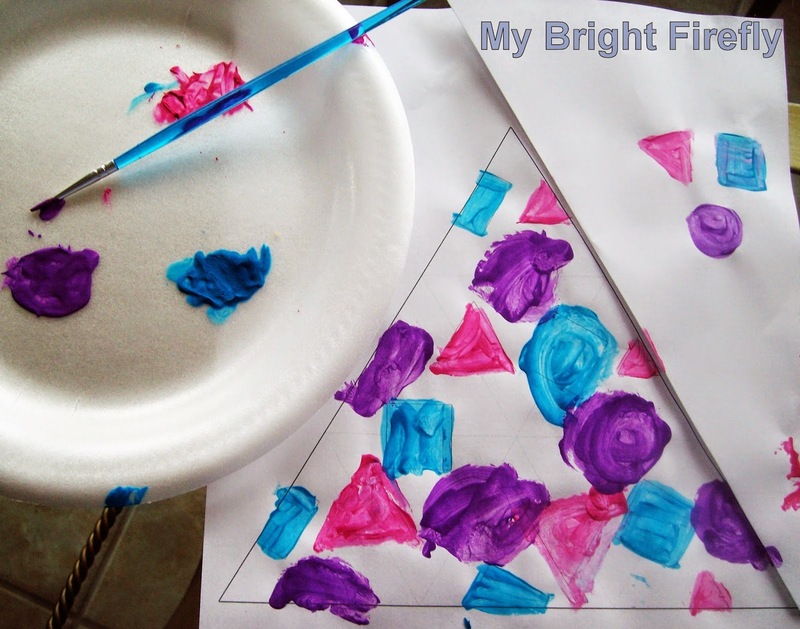 After the paint was dry, she cut them into the smaller triangles and pasted them onto the ocean. Our Little People polar bears were happy sleeping in My Firefly's ocean. We sang a new lullaby to them using the CD enclosed. 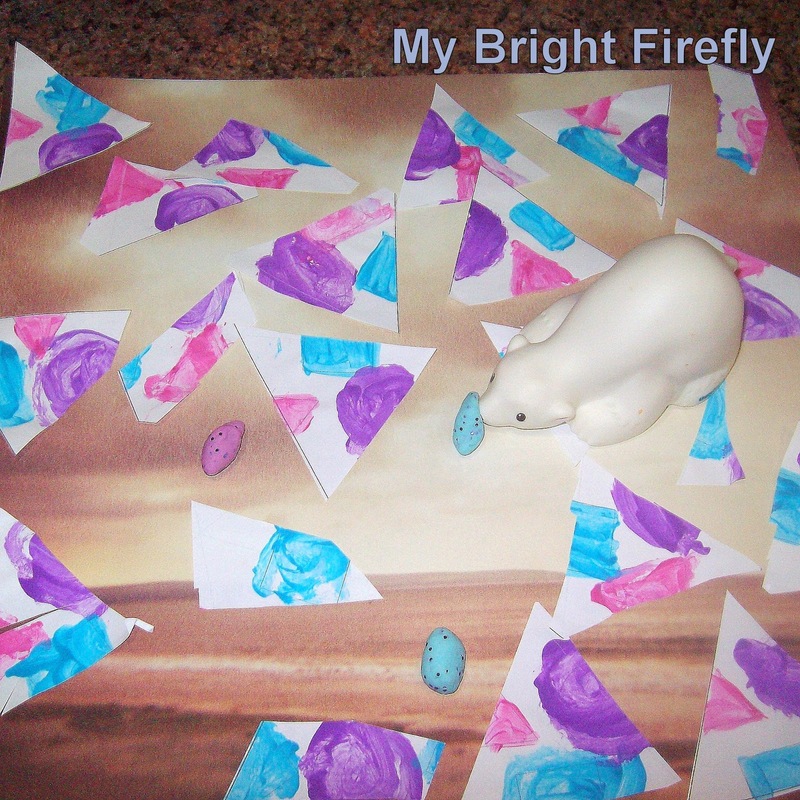 Then My Firefly decided the polar bears were hungry. So we made them some play dough fish. Well, fish were a big news for My Firefly. She thought polar bears love to eat grass. It is beneficial to continue singing lullabies with preschoolers as a part of bedtime routine. The songs promote bonding and increase self-esteem and confidence. Singing lullabies, or favorite songs, is the best music class for little musicians (and free of charge). Lullabies can be used to learn a foreign language. Sung as a last memory of the day, lullabies make remembering new words and grammatical structures an easy and natural process. You can find our collection of the Letter of the Week books and activities here: Creative ABCs.